Case Study - ARC Migrates Its Core Business Application. Case Study - LACMA Makes Buying Easier. Case Study - CMA Industrial Tire Portal for Dealers. R.B. 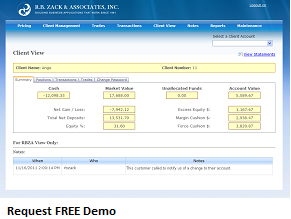 Zack & Associates has created a client portal and monthly statement system we are offering as a service to our Precious Metals Trading clients. The system manages all aspects of your clients’ financial positions, account history, and transaction-related documents. The system is turn-key, meaning the responsibility for hardware, software, backups, and live pricing feeds belongs to R.B. Zack & Associates. You pay a one-time setup cost and a per-client charge with our SaaS offering, saving you the enormous costs of custom development. R.B. Zack & Associates has been developing software for the Precious Metals industry for many years. We are successful because we understand the business. From the nuances of margin trades, to the interest and storage fee calculations, equity management and reporting; our Project Managers speak your language. Client portal allowing transparent access to all trade, statement and other documents,and all transaction history. Reasonable startup costs to brand your site and documents in accordance with your corporate standards.